Thx Tom, it's an eyesore when covered with stuff, this is so much better. What an amazing layout. Those multideck layouts offer so much scenic opportunity, it'll be neat to see a cab view of the entire mainline one day. Camera miniaturization has been amazing for lots of hobbies in the last decade. Thought it was about time we posted an update, so here goes. We actually worked Tuesday and Wednesday this week. The Interbay Pasco panel has been tested and passed; with all 14 routes programmed. The next step is installation. We positioned the panel and the megapoints board in their approximate locations on top of the yard. 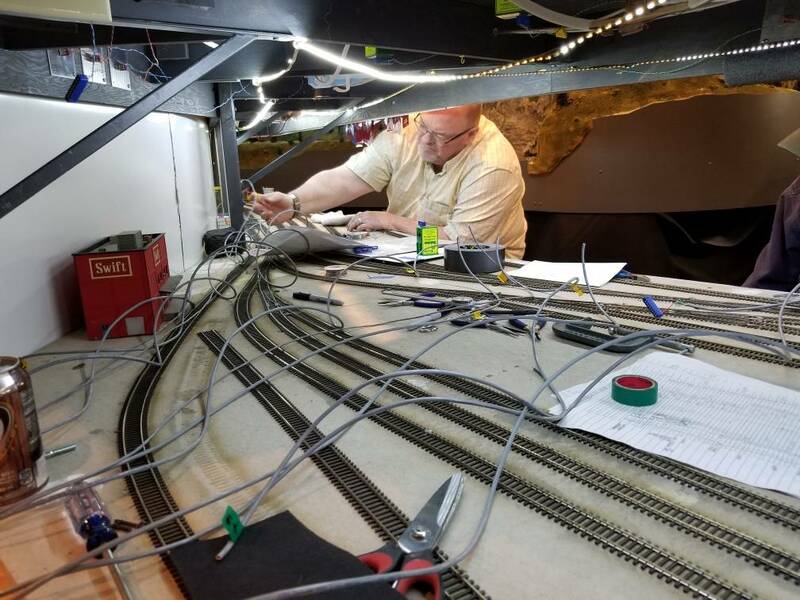 We then laid out the tortoise connecting wires leaving sufficient slack to account for subtle changes in distance to the final location of the megapoints board under the yard. Once all 23 turnout wires were labeled we, or more precisely, I went under the table and labeled the actual tortoise with its corresponding number from the megapoints tortoise board. It will be much easier to match them up this way when we're (I am) upside down at the actual moment of install. 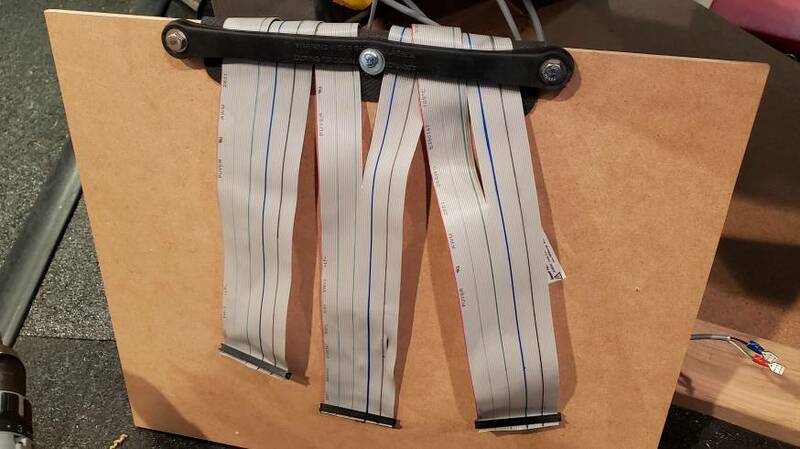 The next step was to review our panel mounting strategy to ensure that only the ribbon cable moves, not the wires (and all the solder joints) attached to the back of either panel. Here my father-in-law Mike, on the left, discusses ribbon placement with Scott and Ed. We determined that the best plan was to remove the bottom of the box and recut another piece that extends another 8 inches to ensure we can mount and secure the wires so that the ribbon cable absorbs the movement. We will also cut a recess in the back of the box so the wires exit the back in a linear plane. Once we had our plan, we set out to work on other tasks. Mike and I glued in all of our primary trees in Black Diamond. We then used various means to hold them in upright positions, including 123 blocks, while the glue set. Meanwhile Scott and Rey put the final touches on the South Seattle Yard panels. All that's left before testing is to finish the ground wires. Their panel "neatness" puts mine to shame. That's it for now. We'll need wait for the new Edge Connectors to arrive from Digi-Key before completing the tortoise connections, but they may be here early next week. So until next time, thanks for checking in. dalebaker and WM183 like this. Great work Michael, and hudos to your "crew". I have the same Green/Black set of tape measures LOL. WM183 and RGW like this. There a palpable sense of excitement. Proceeding nicely, Michael. I am also looking forward to possibly seeing an eventual virtual cab ride. A quick recap of last night's work party. Doug and I had to restring the tortoise wires after determining we chose the wrong wire last week. We found that the blue sheathed wire was extremely brittle and as such was inadequate for our purposes. We switched back to the two connector gray sheathed wires we've used with the panels. Doug and I continued to work on the panel install. We cut out the recess in the back panel for the wires and instead of making a new drawer bottom, we merely removed the existing one and reattached it further back in the drawer to create the desired overhang. 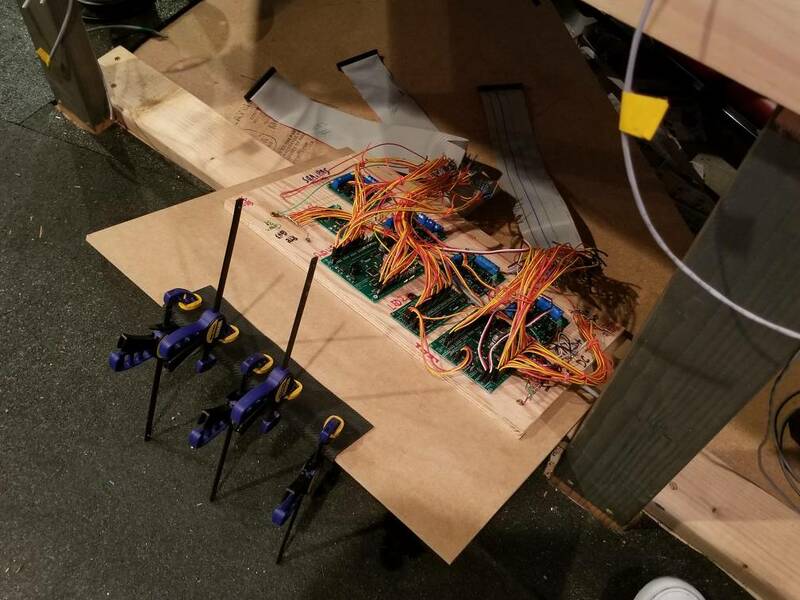 Ultimately we will attached the ribbon cable underneath the drawer overhang to ensure only the ribbon cable moves, not the wires with their supporting connections. Once that was complete, we inserted the panel in the drawer and attached the drawer to the slides. While we were doing that, Rey and Scott completed the wiring on South Seattle Yard. Next week they will test continuity and begin testing under power. Ed continued to install the remote power switch for our pyramid power supply. It will provide all the support for the megapoints board and the panel. Behind the fascia he's run conduit from our dedicated power outlets along the south wall. It will run through the switch and into the power supply. It glows when on, so when we shut down for the night, we'll know if we forgot to turn it off. Well, that about sums it up, thanks again for checking in. dalebaker and BoxcabE50 like this. Been a couple of weeks since our last update so this one might take a couple of posts. As you may recall the next step in the yard panel install was to mount the megapoints board as close to the panel drawer as possible. We determined that it was best if we suspended the Mega panel under the drawer and give the panel extra reach so we could minimize tension on the ribbon cables. 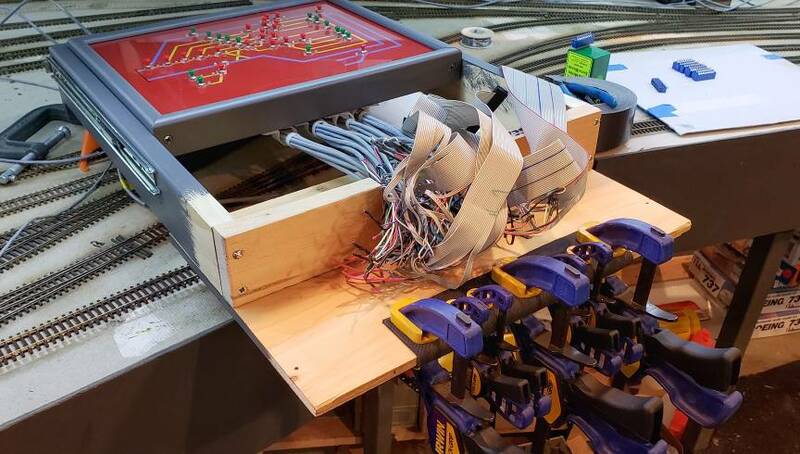 The first thing we did was mount the Mega panel to a square piece of hardboard, with an extra 6 inches of depth to accommodate the ribbon cable and about an inch and a half wider to let the hardboard act as a runner. We also attached part of a mouse pad onto the extention to alleviate any rub against the hardboard and to increase friction in case of unwanted "pull" when the cables are extended. The frame for the panel was probably over engineered, but it works beautifully. The hardboard slides easily into the channel provided. We also made it so that there are stops on the backside to prevent pushing it through and a drop latch on the aisle side. This will allow us to take the panel out to attach wires or replace components if that is ever necessary. This pic is blurry but you get the idea. By placing the panel upside down we allow the ribbon cables a place to move freely as they extend and retract, clear of any interference from any of the electronics. We still have to affix the cables to the underside of the panel, but that's the last step in this part of the process. Once we had the Mega panel in place it was time to start installing our new Sullins edge connectors. Both Ed and I went to work getting them in place and unbeknownst to us both, Doug was taking pictures. We were able to get all 24 attached to the wires, but will have to come back and solder them next week. Thanks for checking in. Joe Lovett, dalebaker and BoxcabE50 like this. Just arrived home from a week in SoCal sunshine and spent some time in the train room today. On the workbench it's clear Rey and Scott are very close to completing the testing of South Seattle Yard. We'll tackle its installation as our next big project. 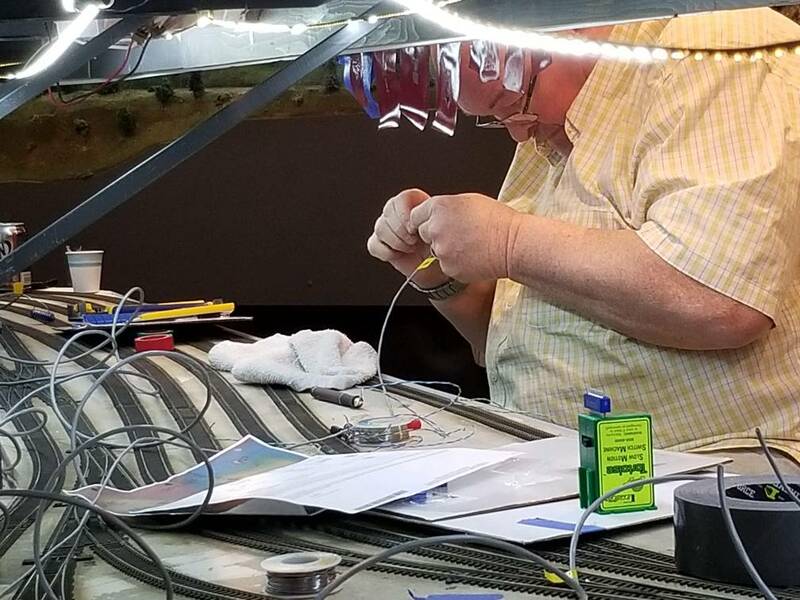 After looking around, it was also clear Doug and Ed completed soldering the edge connectors, so we need to complete the ribbon cable supports and then we can wire the turnouts to the Mega panel. As such, I spent the next couple of hours working on the supports. The first task was to glue the mouse pad to the drawer panel. Then I used tarp hold downs to create a friction stay on the underside of the extensions. You can see it here. Well that's enough for tonight. This coming Tuesday we'll wire up the tortoises and install the power pack. Until then, thanks for checking in. Joe Lovett, dalebaker, gjslsffan and 1 other person like this. 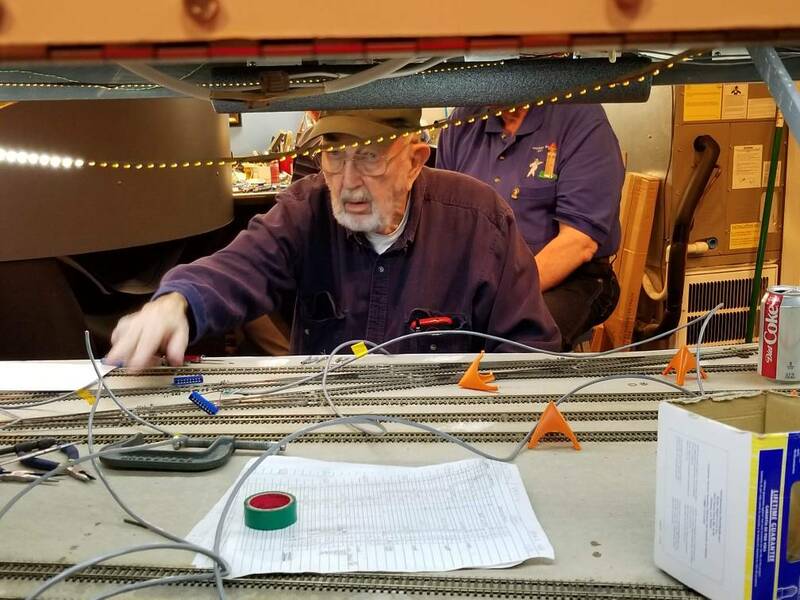 When I started this blog it was my hope to share my enjoyment of the model railroading hobby with others. Over the years I've been pleasantly surprised by the growing interest in our progress and at this stage of the game I am just humbled by your continued interest and involvement in the RGW. RailMix, Joe Lovett and BoxcabE50 like this. Had a few minutes this evening so I went out to the train room and grabbed the drop bolt for the Mega panel insert. Decided to drill a hole in the top of the bolt and epoxy a screw eye into the top so I can affix a string to it. This way it won't get set aside and misplaced when we take it out. The screw eye is about 1-1/8 inches long but I didn't need the threads, so I used a hacksaw to cut that end off; leaving only the eye. I then epoxied the two parts together. After the epoxy set, I used an old fishing lure knot and affixed the string to the new fixture and another screw eye, which I mounted in the Mega panel mounting board. Now we're set whenever we need to pull out the Mega panel. Filing this in the "always one more thing to do" file. Ha ha. If you don't have one of these files, (I do! ), are you actually a model railroader? A quick recap of tonight's progress. 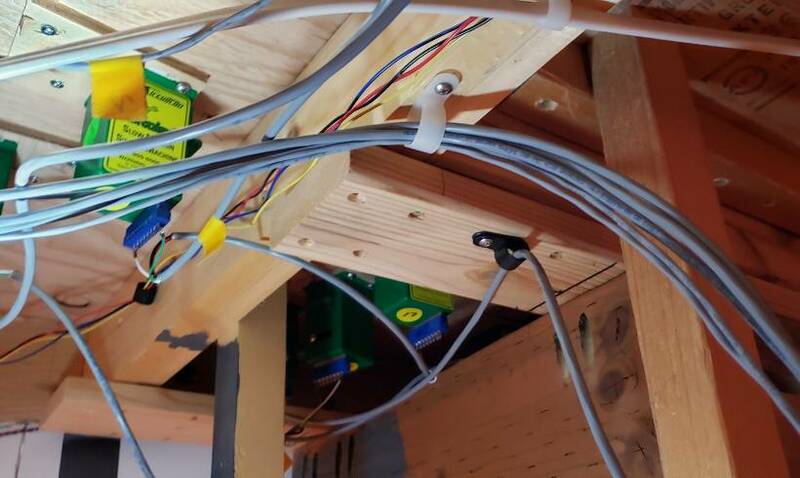 With the help of Ed and Doug, yours truly spent literally 2 hours upside down under the table installing tortoise edge connectors and running wires back to the Mega panel. I started by placing all the edge connectors in place then routing the wires cross member to cross member. As you can see here, the gray jacketed turnout wires eventually came together just west of the Mega panel. 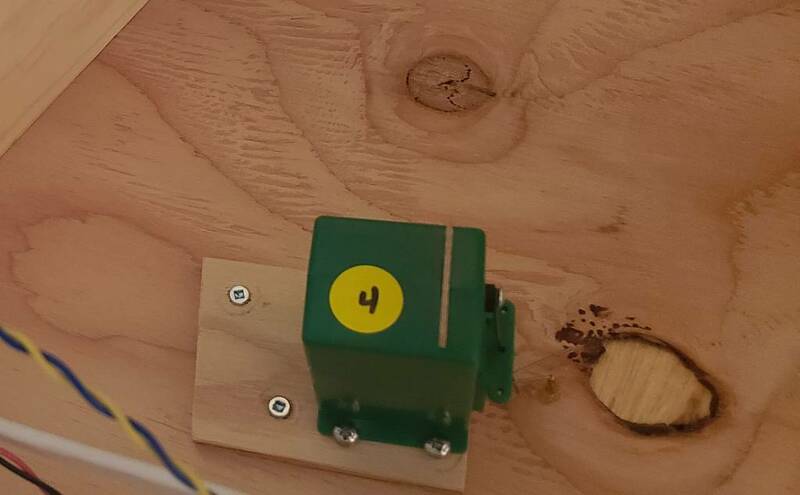 Once done, we were able to start connecting the turnout wires to the Megapoints (stall motor) tortoise boards. I think we were able to get 9 of 23 wired before calling it an evening. dalebaker and gjslsffan like this.